"Mighty oaks from little acorns grow." 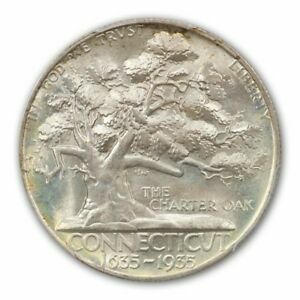 And it is the mighty Charter Oak that dominates the obverse of the Connecticut Tercentenary half dollar. When an agent of the English Crown attempted to confiscate this colony's royal charter in 1687, a cavity within the ancient landmark served as a secure hiding place for their treasured document, thus assuring Connecticut's continued independence. Felled by a storm nearly two hundred years later, the Charter Oak was subsequently memorialized by the placement of a white marble marker at its former location and the naming of adjacent roadways after the revered tree. The earliest settlements in Connecticut were established by the Dutch about 1614. As in so many Dutch communities, English settlers soon came in sufficient numbers to dominate this region. No formal government existed until 1635 when John Winthrop the younger, armed with a patent from the Earl of Warwick (who had no legal authority to grant it), proclaimed himself governor of the region. He was ultimately recognized as such by the "freemen" of Connecticut, although the colony itself had no legal standing until 1662 when it was finally granted a royal charter by King Charles II. The King's successor, James II, sought to disband all of the old colonial divisions and declared a consolidated Dominion of New England, naming Sir Edmund Andros as its governor in 1686. Arriving in Hartford, Andros announced before a meeting of the General Court that he had come to seize the royal charter, which was then in the room. Acting quickly, the proud citizens of Connecticut doused the lights, allowing Joseph Wadsworth to grab the precious document and flee the room. He secreted it within an ancient tree on Wyllys Hill, and this silent guardian was ever-afterward known as the Charter Oak. Frustrated in his attempt to gain control of Connecticut and the other obstinate colonies of New England, Andros was soon returned to the Motherland in chains following the overthrow of his patron, James II, in the "Glorious Revolution" of 1688. 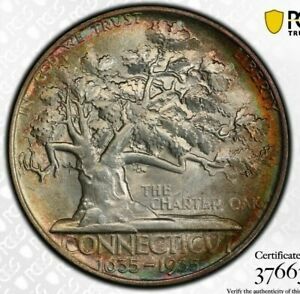 Connecticut would thereafter be an independent entity until joining the union of states a century later. Acknowledging 1635 as the beginning of formal government in Connecticut, that state appointed a Tercentenary Commission to oversee the celebration planned for 1935. Its chairman was Samuel Fisher. 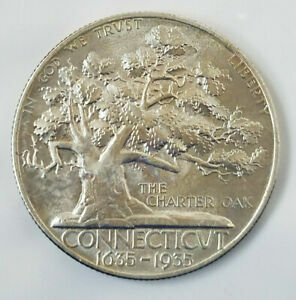 Unlike many such commissions which wait until the last minute to request a commemorative coin, or even seek one that's coined subsequent to the event, the Connecticut organization was quick in prompting legislation for its coin. 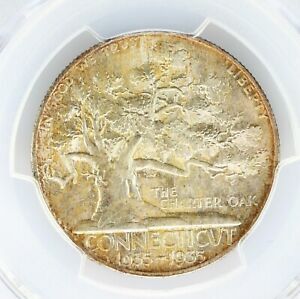 Passed with only minimal debate, the Act of June 21, 1934 called for the coining of 25,000 half dollars to mark the 300th anniversary of Connecticut's founding. Despite the usual directive that the sponsoring organization pay for all of the Mint's expenses associated with this coinage, the project was actually undertaken by the Public Works Administration (PWA), one of President Franklin D. Roosevelt's "alphabet soup" relief agencies. 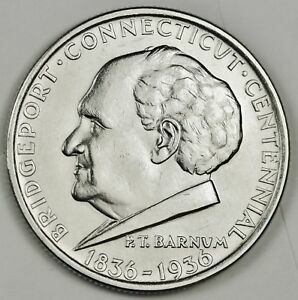 Local artist Henry G. Kreis (who later created the Bridgeport, Connecticut half dollar) was commissioned to prepare models under the direction of famed sculptor Paul Manship. This collaboration produced superb designs of a highly stylized character. 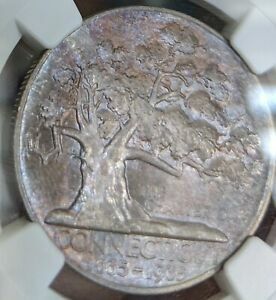 Both the Charter Oak, with its bold, oversized leaves, and the monumental eagle, with its defiant expression, may be included among the finest elements to appear within the commemorative series. The Commission of Fine Arts gave its provisional approval of the Kreis models on December 6, 1934, subject to his strengthening certain features of the eagle. 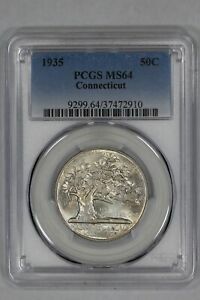 This was done, and the final versions of obverse and reverse were accepted by the Treasury Department on February 6, 1935. 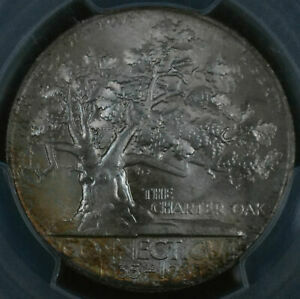 The central element of the obverse is, of course, the famed Charter Oak. It is modeled after a painting by Charles DeWolf Brownell belonging to the Connecticut Historical Society and created just one year before the tree was toppled in 1856. A fictitious hole has been added for its thematic value; otherwise, the depiction is fairly accurate (discounting the oversize leaves, a bit of artistic license). Below it are the words THE CHARTER OAK. Above, arranged in arcs around the periphery are the statutory inscriptions IN GOD WE TRUST and LIBERTY. 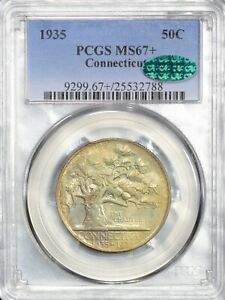 The ground beneath the tree forms an exergue in which CONNECTICUT 1635-1935 appears in two lines. On the reverse is a three-quarters view of an eagle perched upon a rocky mound. E PLURIBUS UNUM is to the left of its right leg. Arranged in arcs around the periphery are UNITED STATES OF AMERICA and HALF DOLLAR. The eagle is surrounded by an arc of 13 tiny stars. The artist's models are unsigned. 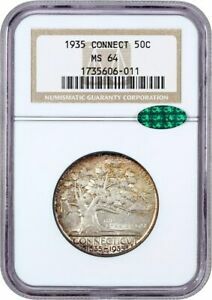 In April and May of 1935, the Philadelphia Mint coined 25,018 Connecticut half dollars (the odd 18 coins were reserved for assay and later destroyed). 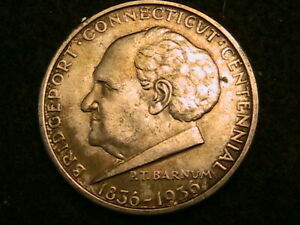 These were available well in time for the Tercentenary, and most were sold to residents of Connecticut and visitors to the celebration at $1 apiece. 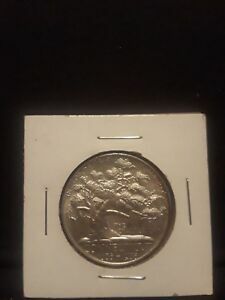 The coins were so well received, in fact, that the Tercentenary Commission's executive secretary, Herbert L. Crapo, confessed to prominent coin dealer and notorious commemorative promoter L. W. Hoffecker that "We have disposed of our entire original allotment of 25,000, and are having some difficulty in reserving a few which we want to present as gifts to dignitaries." 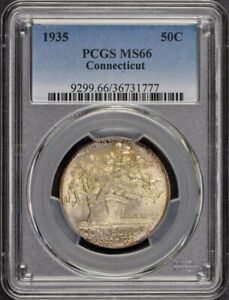 When the speculative market for commemorative coins heated up in 1936, this issue quickly rose in value to $6. 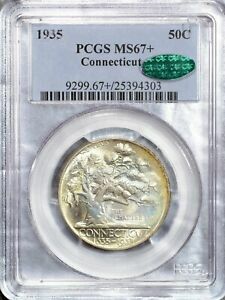 By comparison, a proof silver dollar of the Seated Liberty design was then valued at only $5! 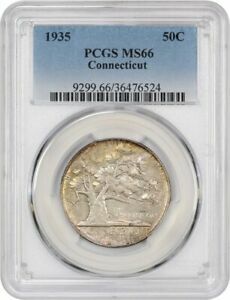 Due to its wide distribution, no known hoards of Connecticut half dollars ever came into the market. With most examples sold to the general public, many seen today have been mishandled. 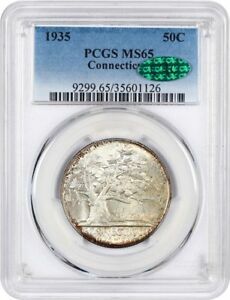 This has served to keep its value fairly high for such a relatively recent coin. There's no indication that these coins were actually spent as money, but many have been nicked, abraded or harshly cleaned. 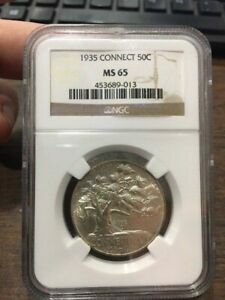 The grades typically encountered range from AU-50 to MS-63; quite a few mint state coins have suffered from being "dipped" in mild acids to remove unsightly tarnish acquired during years of storage on attic shelves or in dresser drawers. 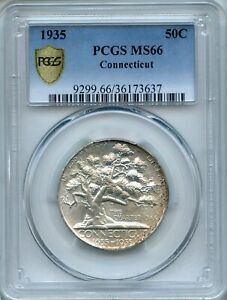 MS-64 examples are scarce, but MS-65 and higher grades are especially so. Although most Connecticut halves are well struck, the small and shallow stars may be indistinct. Check for wear at the base of the tree and on the upper part of the eagle's wing. 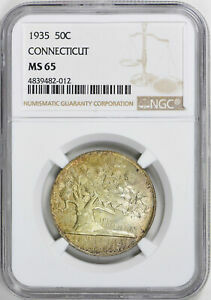 The late numismatic scholar Walter Breen reported the existence of four or five matte proofs, at least one of which is traceable to the estate of former Mint Chief Engraver John R. Sinnock, a connoisseur of this style. These have been faked by chemical treatment of well-struck, regular-issue specimens to simulate the etched appearance of a matte proof. Authentication of any proof offered is mandatory. 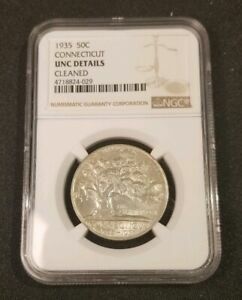 More available and quite collectable are examples of the original packaging in which Connecticut halves were sold. There are numerous varieties of small boxes, each designed to hold a single coin. These come in both hinge-top and slide-out styles, usually with a gold or silver foil wrapping. This is typically printed with the state seal or an inscription referring to one of several banks which distributed these coins. With a velour interior and sometimes additional printing inside, these are very attractive and eagerly sought as tie-ins to the coins themselves.